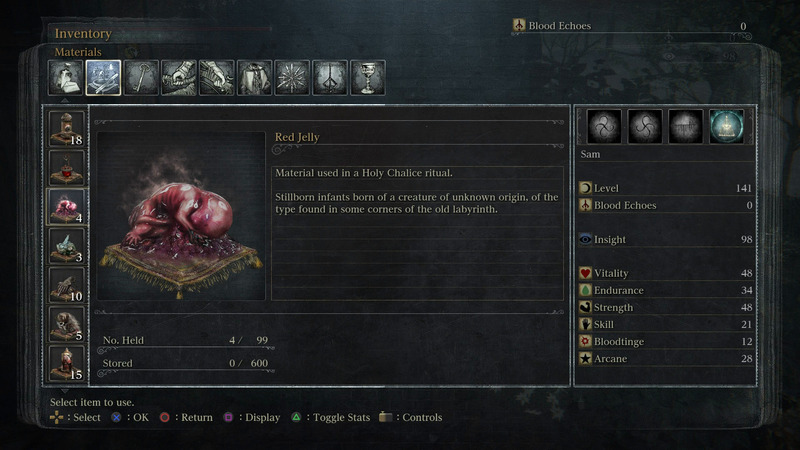 Learn where to find and how to farm Red Jelly for Chalice Rituals in Bloodborne. Bloodborne is a mysterious beast in and of itself, with a rich and dark story and a world begging to be explored. A lot of unknowns await players brave enough to venture into the Chalice Dungeons, and to begin your journey you’ll need to create Chalice Rituals, of which Red Jelly is an important component. Bloodborne will give you a couple for free later on in the game, but if you want more, you’ll need to do some grinding. To find Red Jelly, you will need to progress through the game until you reach the Lecture Building. On the ground floor is a murky door that leads to the Nightmare Frontier, on the right-hand side of this door is where you’ll find two Red Jelly. Lower Loran Chalice Dungeon: Ritual Blood (5) x9, Blooming Coldblood Flower x4, and 11,500 Blood Echoes. Great Isz Chalice: Ritual Blood (5) x9, Pearl Slug x3, Arcane Haze x25, and 11,500 Blood Echoes. There is one final means of finding Red Jelly, and that is by purchasing them from the Messengers in the upper bird bath using Insight. You can only purchase Red Jelly after you have gained access to the Great Pthumeru Ihyll Chalice Dungeon, which required four Red Jelly to unlock. Ideally, you should use the two Chalice Dungeons above in order to farm enough Red Jelly to unlock the Great Pthumeru Ihyll Chalice Dungeon, and then once you’ve complete it, just spend Insight to save time farming for Red Jelly. Bloodborne is currently free with PlayStation Plus for March, 2018 and while there’s no word on a sequel, it looks like FromSoftware is up to its usual tricks of being cryptic with their teaser for Shadows Die Twice.